Aloo Beans — Kitchenpostcards 30 minutes until tasty dinner! The ubiquitous Potato – what would we do without it? Potatoes are so commonly used in Indian food – in northern cuisine as a part of Aloo Parantha, Aloo Gobhi, Dum Aloo to name a few common preparations and in the southern cuisine as a filling in Masala Dosas and various curries – that you’d think it is an indigenous tuber. But, of course, it isn’t! Potatoes are one commodity that traveled across the world with various colonisers. The species is actually native to the Andes in South America. From there it was the Spaniards who took it to Europe and the Portuguese eventually brought it with them to India. My source of knowledge is the mighty Wikipedia. Please share your tidbits of knowledge with us in the comments. Over the centuries this starchy tuber has found its way into many Indian dishes. Without any further talk let’s get to the recipe. Inactive: 10 minutes; Active cooking ~ 20 minutes. 2-3 sprigs of fresh coriander – washed and roughly chopped. Gather all the ingredients, take out vegetables and place spices on your counter. Then begin by cleaning and prepping beans and potatoes. I used red baby potatoes for this dish with their skin on. If you want to keep the skin on then wash them well, scrubbing the skin under running water and then wiping them with a clean kitchen towel. After that let them sit for a few minutes to dry the skin. Then proceed to cut them into cubes. Next, wash beans. You can use a deep bowl and rinse in a water bath 2-3 times. Or clean them in a colander under running water. Make sure you moves them around with your hands a couple of times to loosen any dirt that might be sticking to the beans. Pat dry with a kitchen towel and then chop into even sized pieces, half an inch to an inch in length. After this, slice one medium-sized red onion lengthwise. Keep aside a few slices for later. Finely chop garlic cloves. Next, clean a few sprigs of fresh coriander, roughly chop and keep aside for garnishing. Beans and Aloo cooking in a tadka with onion and spices. Once your ingredients are ready, put a deep, heavy bottomed pan or a kadhai (indian style wok) on the stove and heat it on medium high. To this add olive oil. Followed by cumin seeds. Once the seeds start spluttering, add garlic and onions and stir. Saute for a few minutes (~ 5 minutes) until onions are translucent. Be careful to keep the heat on medium high, otherwise garlic will burn very quickly. To this tadka add dry spices – turmeric, coriander powder, chilli powder, salt and pepper. The quantities described here are for mild spice- adjust according to your required spice levels. Next, tip in potatoes and stir fry them for a few minutes. Keep tossing and moving potatoes to prevent them from sticking to the bottom of the cooking vessel. Once you see that some sides of potato cubes are browning, add beans. 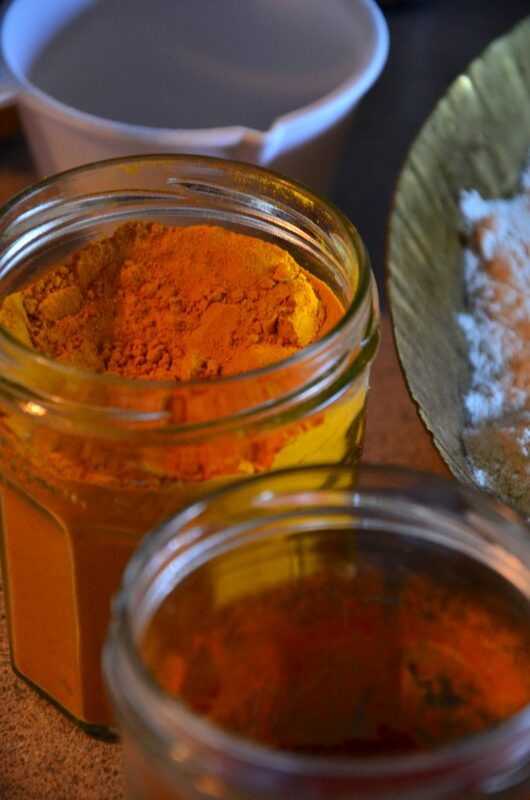 Mix well to coat with the tadka. I add a few slices of raw onions on the top. Then I cover and let the sabzi cook on medium heat for 8 – 10 minutes. Moisture from beans will help cook potatoes and onion slices. Ready to cover and cook on medium heat. Use a fork or a knife and pierce a potato to check for doneness. If it is soft with no resistance, your sabzi is ready. Transfer to a bowl and enjoy with a bowl of fresh dal, a dollop of plain white yogurt and hot chapatis. That is what I call comfort on a plate! Potatoes are uniquitous across India, even though they did not originate there. 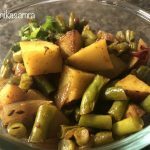 This Aloo Beans recipe is easy to make and extremely tasty. Then begin by cleaning and prepping beans and potatoes. Cube potatoes and slice the beans into 1/2 inch pieces. After this, slice one medium-sized red onion lengthwise. Keep aside a few slices for later. Next, clean a few sprigs of fresh coriander, roughly chop and keep aside for garnishing. Put a deep, heavy bottomed pan or a kadhai (indian style wok) on the stove and heat it on medium high. To this add olive oil followed by cumin seeds. Once the seeds start spluttering, add garlic and onions and stir. Saute for a few minutes (~ 5 minutes) until onions are translucent. To this tadka add dry spices – turmeric, coriander powder, chilli powder, salt and pepper. Next, tip in potatoes and stir fry them for a few minutes. Once you see that some sides of potato cubes are browning, add beans. Mix well to coat with the tadka. Add a few slices of raw onions on the top and cover and let the sabzi cook on medium heat for 8 – 10 minutes. Garnish with chopped coriander and serve with warm rotis. The quantities described here are for mild spice- adjust according to your required spice levels.